Ahh, the unique, hidden grandeur of mediocrity! The glories of being pedestrian! If Pixar's The Incredibles showed that not everyone can or should be considered super, then Saaheb shows that not everyone has to be super to be special, needed, happy or loved. It is a veritable celebration of the middle child - the kid that's neither the hero nor the underdog, the one who isn't rebellious, spectacular or often even noticed. In a clever symbolism, the titular protagonist, Saaheb, has only one talent: goalkeeping. Like the goalkeeper, he occupies an unglamorous but critical and unique role. "No one notices whether I'm here or not!" Saaheb says. And yet, like the goalkeeper everyone forgets about or even disparages ("He can't even score a goal!" his father grumbles. "All he does is stand around! "), it's Saaheb who is the family's protector and, in the end, savior. In fact, so touching is this theme of hidden joy and uncelebrated sacrifice that, even as the audio skipped and the cameraman forgot to focus, the PPCC ended up a blubbering pile of soggy, used tissues. Don't cry, middle child, you're a star! 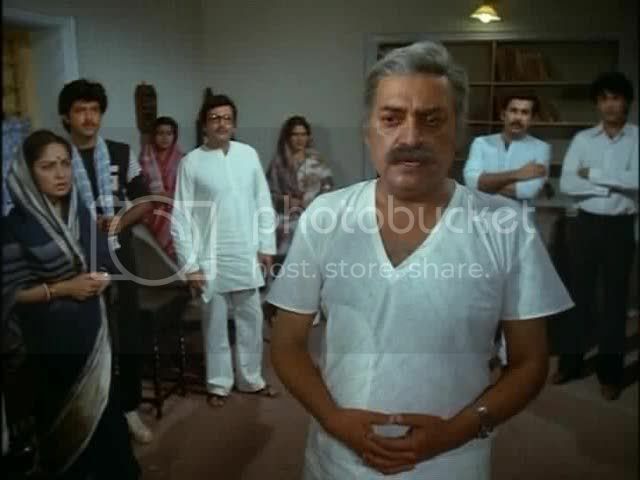 In a drab, crowded working class house, a hypertensive widower (Utpal Dutt) lives with his three married sons, their wives, his unmarried son - Saaheb! (Anil Kapoor) - and his unmarried daughter, Bulti (Nandita Thakur). Our secret hero, Saaheb, is the typical child lost in the middle: he is the peacemaker and, often, the errand boy for everyone else in the house. His best friends in the family are the young Bulti, with whom he scraps and teases, and his protective older sister-in-law, Sujata (Rakhee). Both Saaheb and Bulti are constantly made by the rest of the family to feel that they're worthless weights: Saaheb because he has failed college (again!) and is jobless and prospectless, Bulti because she is still unmarried. A suitable husband is eventually found for Bulti, but the family despairs: they can't afford the wedding! While their father grieves over leaving his children with nothing and having to sell the house to pay for Bulti's wedding, the older children connive and plan on what they'll do with their share. The only ones who seem to care about keeping the house intact are Saaheb and Bulti. And in the end, it's goofy, forgotten Saaheb who saves the team. Grafted over this story is the obligatory romance which, while a little extraneous, is still quite charming: Saaheb's neighbor is the outgoing, tomboyish Natasha (Amrita Singh) who initiates the courtship by brazenly calling over from her balcony: "Hey! Want to be friends?" Saaheb resists for about half a song, and then they frolic around for yet more songs - sometimes on the pavement, sometimes in their fantasy future. An Anil Kapoor character dominated by a strong woman yet again. Like Virasat, this is another Anil Kapoor movie that intelligently tackles dharma. Except here the dharmic duty - the submission of the individual to the larger community - is just portrayed as straightforward, poignant sacrifice. So none of those hairy moral consequences and ambiguities - thank goodness for our brain! - but with the same delicate, humanistic touch - thank goodness for our heart! There was also an interesting Buddhist shout-out in the end. This gives the whole dharma issue a fresh, new spin, as we're not talking about being a cog in the almighty caste system à la Hinduism, instead we're talking about being a drop in the large, amorphous, interdependent ocean à la Buddhism. OOH! Time out for a completely unrelated Buddhist joke! What does the Zen Buddhist ask the hot dog man? "Make me one with everything." Wait, wait - we've got another one! How many Buddhists does it take to change a light bulb? Two. One to change it, and one not to change it. Oh yes - so Saaheb is directly likened to Siddartha Gautama, the founder of Buddhism. While this is a bit of a stretch - Saaheb's a great guy and clearly in tune with the Buddhist philosophy of interdependent existence and humble compassion, but uh... - it's still a really novel parallel. Good ol' Siddartha just doesn't come up in movies that often! And maybe it's not such a stretch: compared to his selfish brothers, Saaheb's definitely further along the path to Enlightenment, that's for sure. The other great thing about Saaheb, as we mentioned earlier, is this glorification of the ordinary. Generally, films either deal directly with the realization of your wildest dreams, or deal with the painful fall-out of realizing that your wildest dreams are not so great or just plain unattainable. Saaheb and his beloved Natasha instead dream small: and yet even these humble aspirations (working as flight attendants or train ticket collectors) are transformed into something Elysian and grand and perfect, just by their sheer joy. In the end, we cried a lot more than Saaheb did for his new future because we just couldn't accept it with the same easy-going malleability as him! This song became our favorite when Anil and Amrita started cavorting around the airport. This cap doesn't capture the grand, open-space fun of dancing on the tarmac while planes take off. Wheeee! All the performances are relatively understated and charismatic (and Anil Kapoor is awfully boyish and skinny!). The production value is low, in keeping with the setting, and there are few songs. Yet this was such a sweet nugget of a film, with such a contented (even enlightened!) message, that we definitely recommend it. And don't forget, PPCC readers, Anil on Regis tomorrow! Awww, I want to see Anil capering amongst the giant airplanes--so symbolic! So LOUD! On a side note, is high BP really all that common in India or is that a filmi-frequent condition? Man..I am glad you caught this and liked it. Love the movie and it always makes me cry. Saheb's goodness, Natasha's boisterousness, the way the badi bhabi runs the house and looks after the father and of course Utpal Dutt's performance as the sad patriarch. Nice depiction of the Indian family. And the ending scenes when the family visit him in the hospital are really heart-wrenching. Plus KK's great song - "Kya Khabhar Kya pata".. and of course, "Yaar bina chain kahaan re". Also, one small detail - Nandita Thakur is not Bulti, she is the sister from Pune who arrives too late for the marriage. That's an interesting set of dream movies you pulled together. I wonder what other "small dream" movies there are out there. Probably tons but I don't remember them...um...because they're small. "In the end, we cried a lot more than Saaheb did for his new future because we just couldn't accept it with the same easy-going malleability as him"- - oh yes, I completely agree. WHAT?!!! ANIL IS ON REGIS TOMORROW? Ahem, I mean: what? Anil is on regis tomorrow? Fake host meets real host. I liked the jokes much more than I liked this movie. Also. oh my god, the Today and the View too?! Ajnabi - It was during their two-step on the tarmac and in the airplane aisle that I fell in love with this movie. Isn't high BP common everywhere? Srinivas - Oops, another error! Thanks for catching that. And totally agreed - this was such a sweet film. Srinivas2 - Will check it out, thanks for the rec! I need to see Amol Palekar in his acting mode too. Beth - Heee! It is rare to find a film which glorifies the common and drab. But it's the best kind, I think, since - as the Buddha said, and I'm paraphrasing - you've gotta be happy with what you got, because desire breeds suffering. Shweta - I do too! I knew about Saaheb's sacrifice thing before watching, and was all ready to find it cheesy and/or clunky and melodramatic... yet it was so touching! What a tearjerker. Memsaab - Her role is unfortunately pretty small, but she leaves a big impression - she's so much fun! Amrita - YESSSS! You didn't loooove this movie, Amrita? Nahiiiiin! Amrita2 - OMG excellent link, thank you! Another Amrita -Anil pairing that is an absolute joy to watch is "Chameli ki shaadi"
Hi love your blog. If you want to watch more films about " ordinary " people catch tapasaya, zakhm and naadiya ke paar( the one with sachin). All gorgeous and equally moving as the wonderful saheb.